One week into the new year and it’s once again time to take a look back on some fun, unique and memorable e-sessions shared by our 2013 couples! I’m trying to cut down on the chit chat — I know you can’t wait to see the photos anyway 🙂 — so here they are without further ado. This year we saw a lot of “fighting”… play-fighting that is! None of the above ideas work for you? Of course you can simply romp around, don animal head masks, and totally have fun like this cute couple did! Do you have fantastic e-session photos? 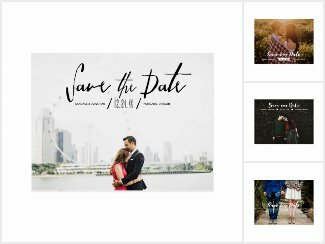 Consider using them on our chic & modern Save the Date templates! If this list inspired you to come up with an awesome idea for an e-shoot, feel free to share it with your bride friends and photographers! * For even more inspiration, click [ here ] to see all of our featured engagement shoots.